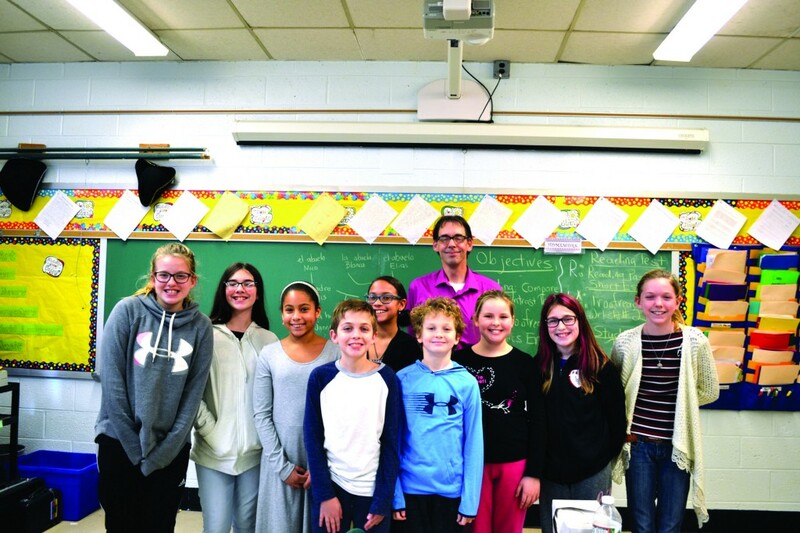 At Charles Street School, resident playwright and teacher Steven Graff is borrowing an idea from veteran Palmyra English teacher Terry Wallace. Wallace created a “Writer’s Cafe” for seventh- and eighth-grade students at PHS in 2016, and at the charge of CSS student Natalie Scerrill, Graff is now leading a parlor of his own with a new creative writing club, where students develop and workshop individual or collaborative projects. Now, arming his own students with the tools to start their portfolios, Graff is giving them a space and platform to be creative. For student Maura Russell, that means channeling her personal experiences into the written word. Russell wrote her grandmother’s eulogy when she died from breast cancer last year, and her cousin was recently diagnosed with ALS, a nervous system disease that weakens the muscles and impacts physical function. Dealing with such serious subjects is no small task for an 11 year old, but with the creative writing club, she’s found a space to cope with death and family illness. “I want other people to know that it’s OK and that you can handle [death], you just need to take baby steps,” Russell said of her goals with her story about a girl who is diagnosed with leukemia. Other students, like Scerrill, are working on action-packed adventures, while Olivia Ottenbreit enjoys drawing from her interests in history, mythology and nonfiction to inform her stories. Richie Butler, whose genre of choice is horror, said the creative writing club is an opportunity for him to build on work he did when he was younger. “I didn’t write that good back then, so now I can probably write it better and make it not as weird and cringey as it was,” Butler joked. While the plans aren’t yet etched in stone, Graff is searching for contests and student publications to which he can submit his students’ work. At the end of the school year, he hopes to showcase their finished projects with a schoolwide read-aloud or open mic.